Costs only ₹50 for 50g bottle. Discover the all natural way to clean your teeth. 1. 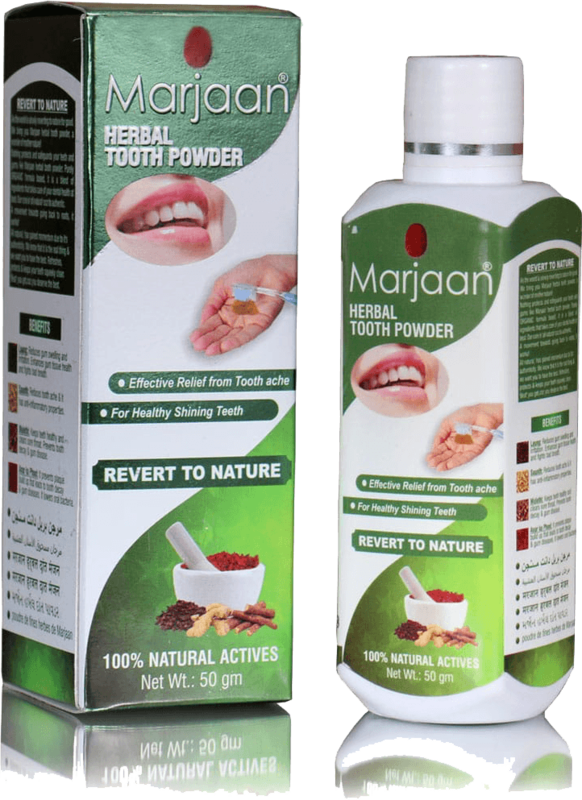 Marjaan tooth powder is all natural. It does not contain any chemical, preservatives, colours, flavours. Free from sodium laurel sulphate (detergent) responsible for causing cancer. 2. Immediate relief from Gingivitis. 3. Quick relief from tooth ache and gums sensitivity. 4. Kids friendly, even if the there is residual left in your mouth and stays there you will never have a problem. 5. Slightly granular for easy gargling and spitting out. Just as the name suggests, we ARE ‘Marjaan.’ Marjaan means precious. Marjaan’s is made from an original Unani medicinal formula making it uniquely distinct. 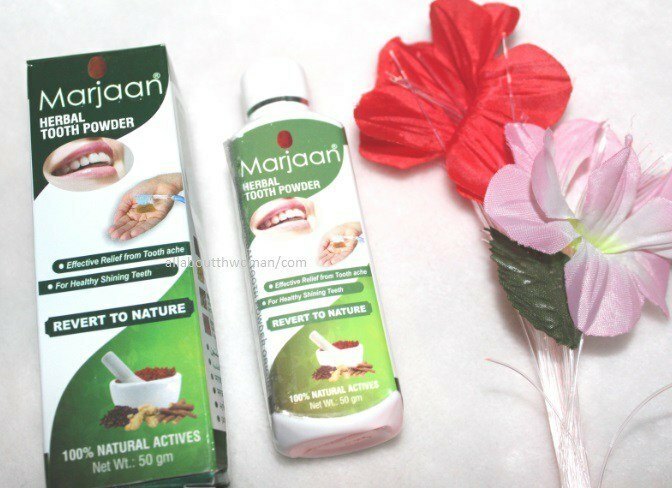 ​Marjaan herbal Tooth Powder give ​complete oral care for your dental health. We are 100% organic. No Chemicals/ preservatives. Marjaan ​tastes great & re-freshening and is made using Harad, Mulethi, Elachi, Saunth, Salt, black salt and Pomegranate Flower. It gives immediate relief from tooth aches, tooth decay & bleeding gums and gives you healthy shining white teeth. Laung– Includes clove, the ever known natural remedy for gum care & bad breath. Cardamoms– Its antiseptic properties make you wear a happy healthy smile. Say goodbye to dental infections & bleeding for good. 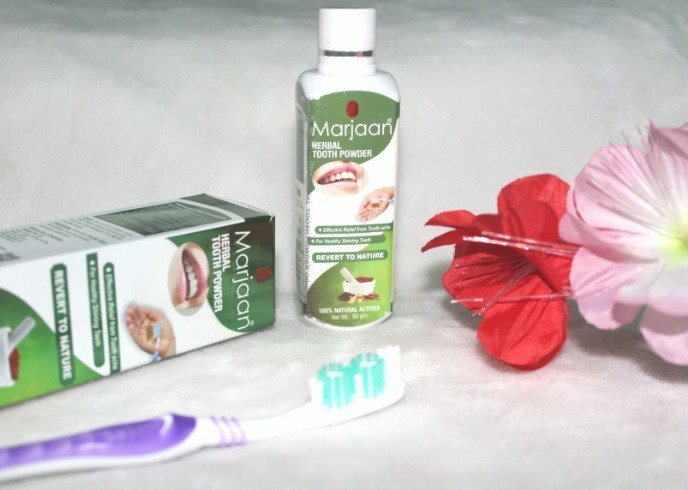 Marjaan Herbal Tooth Powder gives you immediate relief from bleeding gums (gingivitis), tooth ache, tooth decay. It has been tested over a period of 4 years on a sample size of 50 people before being launched. Most of our users with swollen & bleeding gums have testified to immediate relief. Prolonged use keeps away all kinds of dental problems and gives you healthy teeth. Just my thing! I love it & I am sure you will. Any day recommend this tooth powder over others. It is all goodness packed in a little bottle. The dash of clove that you can taste, that is my favourite. I am a fitness freak and I love to maintain a regimen that promises complete wellness & good health. Needless to say my work keeps me on my toes & often I only can catch about a few hours sleep. Fresh breath! is of utmost importance to me and I have to say Marjaan is just the product that qualifies as an all rounder. Don’t take chance with your oral health. Get Marjaan! Experience this wonder, let your teeth & tongue dance to Marjaan. Marjaan leaves a great aftertaste in the mouth making you have a long-lasting freshness. Tickles your palette clean, giving your teeth the nourishing, disinfectants that safeguard your tooth. No hard and fast rules. You like bristles? Take a brush, you like it all conventional, use your finger. 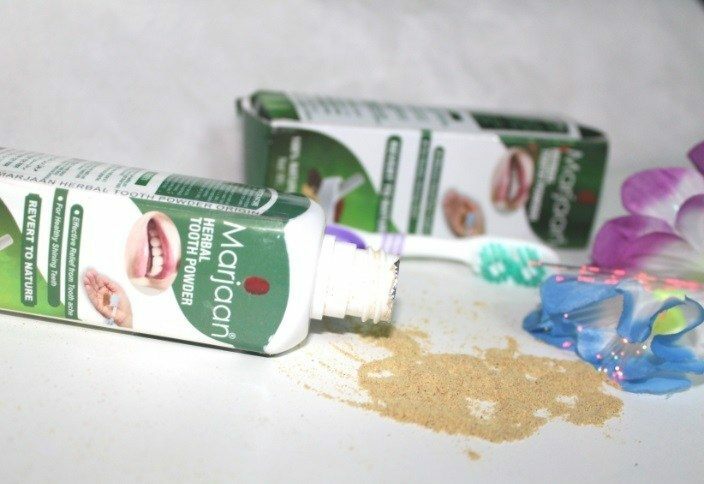 Either way, once Marjaan touches your teeth, your mouth will do the talking. Suited for adult & kids alike. It’s all natural formulae makes it kids friendly.